The Vital Brain Aging Program has been making a "great impact" in our community since 2010. It is a multi-disciplinary program promoting brain health across the county. The program engages community residents, physicians, county organizations, and industry partners. Coordinate the efforts of community support organizations that promote healthy aging. An online information portal serving as the program's hub. A series of educational seminars offered for free to the public. A physician education/support program to implement the highest standards of care in cognitive assessment and treatment. Online resources for the public to identify, track, and reduce risk factors that threaten their cognitive health. A community memory assessment and monitoring program for interested persons. Full-time professional resources to counsel the public about risks for cognitive health decline, early detection of medical conditions that affect cognition, steps toward diagnosis, and appropriate treatment options for underlying causes of cognitive decline. A referral service for directing the public to medical and community resources as needed. A team of well-trained neurology specialists as a referral resource. Like many communities in United States, Orange County is rapidly aging. In 2000, an estimated 9.9% of Orange County residents were aged 65 years and older. A decade later, in 2010, the county's residents aged 65 years and older had increased to 11.1% of the population. In 2020, it is projected that more than 14.0% of the Orange County population will belong to the 65 and older category. From 2000 to 2009, the State of California, Department of Finance estimated that persons over 65 years old in Orange County increased by 22.7%. Between 2010 and 2020, this population is estimated to grow by more than 40%. This rapid aging of the population is due to people living longer and also to the oldest of the baby boom generation (those born between 1946 and 1964) turning 65 years old. This means that, unless we manage our physical and cognitive health proactively, there will be a greater need for caregiving services, health services, and social support, as well as increased need for public funding for health related services. From 2013-2018, OC will experience the fastest population increase in persons over 65 years old even compared to that of California or of the United States. Such population shift will require a comprehensive community-wide approach to address brain health. Since 2010, the Orange County Vital Brain Aging Program (OCVBAP) has been making a great impact in our community promoting brain health through (a) public and healthcare professional education, (b) self-assessment tools, (c) memory screening services, and (d) coordination of community resources and healthcare services as needed. The program and its components are consistent with the goals of the national and global strategies to combat Alzheimer's disease and related disorders. Here is how the OCVBAP is helping our community (data through July 31, 2018). Some of the lectures have been offered in collaboration with the program's Community Affiliates to incorporate brain-stimulating workshops. The program has educated the public through online self-assessment services. 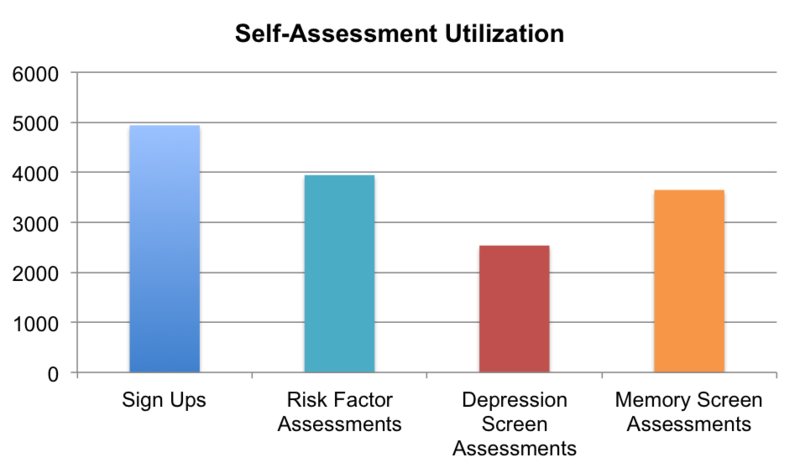 To date, 4,940 community members have used self-assessments to learn about their memory, depression, and risk factors for cognitive impairment. The OCVBAP website has attracted steady use by community members each year.. The program's in-person memory assessment service is currently provided at 5 assessment locations through Orange County. To date, 6,233 assessments have been provided to 3,751community participants, many of whom have returned for a recurring annual assessment. Over 25% of participants have been referred to the assessment service by their primary care physicians and this referral rate has increased steadily as OCVBAP's physician education and outreach efforts continue. Cognitively normal individuals learn about maintaining their cognitive health through managing existing medical conditions, modifying their lifestyle, and engaging in regular physical, cognitive and social activity. When community members are identified with cognitive impairment, they are assisted in finding the right healthcare professionals to diagnose and treat the underlying cause and to manage the condition going forward. All participants are encouraged to monitor their memory annually after age 45. Our memory assessment service has been attracting a steady rate of participants since 2010. Our participants have higher education level compared to the US national average of 12 years and the female participation rate is double the male rate. Male participants are slightly older than female participants, which contributes to their higher rate (30%) of below normal results. 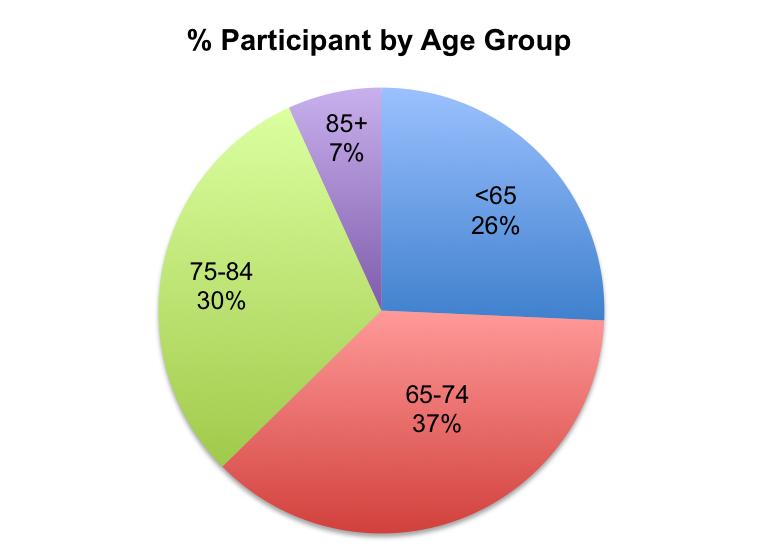 The program's efforts to reach the at-risk population is evident: almost 26% of all participants have been under 65 years old, and 37% have been 65 to 74 years old. Among Orange County community participants in the OCVBAP memory assessment service, the rate of cognitive impairment has been 22%, which is consistent with nationally published data in primary care settings. 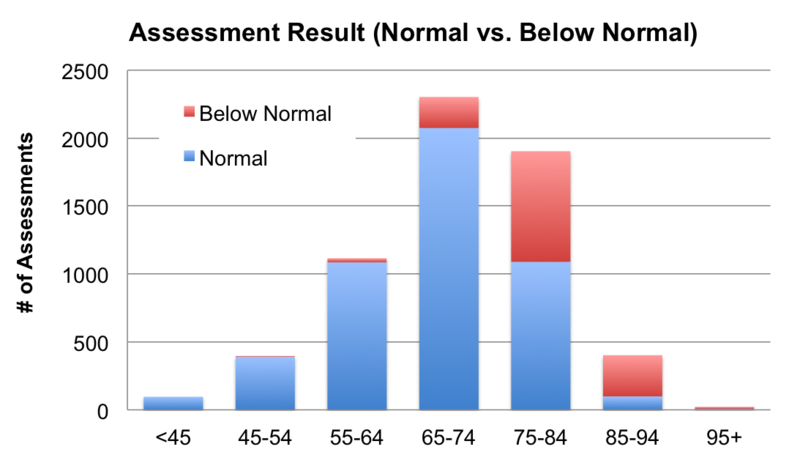 The prevalence of cognitive impairment increases with age. The program also provides clinical Guidelines, which were developed based on published best practices and then refined by the program's expert panel. President of the Campaign to Prevent Alzheimer's Disease by 2020, (PAD 2020), and former director of the National Institute of Aging AD Research Consortium. His review helped OCVBAP launch a meaningful community program, and helped ensure that OCVBAP's mission and future efforts would be well aligned with the larger national effort. Director of the Cleveland Clinic Lou Ruvo Center for Brain Health, and former director of UCLA AD Research Center. Dr. Cummings reviewed OCVBAP's progress to date, and provided constructive feedback towards fulfilling program objectives and aligning cognitive healthcare delivery with national and international directives. Director of the Mayo Clinic's Alzheimer's Disease Research Center, and Chairman of the National Alzheimer's Project Act (NAPA) non-federal advisory council. Dr. Petersen indicated that OCVBAP had implemented many of the planned initiatives described by the National Alzheimer's Project Act as part of a national strategy to prevent Alzheimer's Disease by the year 2025. Dr. Petersen suggested that the OCVBAP model should be replicated in aging communities throughout the USA, so that advances in treatment can be effectively delivered in the early stages of progressive memory disorders when the benefits to individuals, families and society are greatest. When you first meet Laguna Beach resident, David Johnson (DJ), his upbeat personality and positive attitude is immediately apparent. Equally transparent is his fondness toward his father, Ken. "He is my best friend and a much better tennis player than I will ever be," says DJ. A key element of the Orange County Vital Brain Aging Program is the coordination of community resources for optimal benefit. To that extent, we are working closely with these established organizations in the field. Alzheimer's Family Services Center, affiliated with the Pickup Family Neurosciences Institute, is the only day care facility in Orange County dedicated exclusively to the care of people with Alzheimer's or another dementia. Designed in collaboration with the Vital Brain Aging Program, its Mind Booster program is helping people with mild cognitive impairment to maintain their quality of life. The Bower's Museum enriches lives through the world's finest arts and cultures. In collaboration with the Vital Brain Aging Program, the "Art of Healthy Aging" lecture series have hosted many discussions with artists and hands-on workshops to promote healthy brain aging. Chuck Jones Center for Creativity, dedicated to re-invigorating the creative spirit, envisions a world where creativity is known and experienced in every discipline, by the many, not just the few. In collaboration with the Vital Brain Aging Program, the center offers brain stimulating workshops for our community members. The Council on Aging-Orange County promotes the independence, health and dignity of older adults through compassion, education and advocacy. The council provides much needed resources to the participants at the Vital Brain Aging Program.